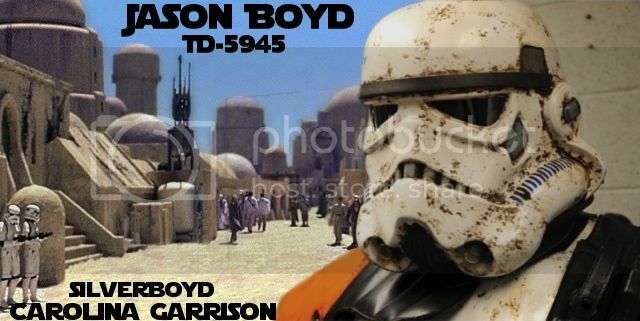 I'm not sure if this is the proper place to extend an invite to the Bespin Base in possibly joining the Carolina Garrison at an October troop in Charleston, SC. I was hoping to get at least a few members from the Rebel Legion to join alongside us at this event. Here is some info about the upcoming October troop. 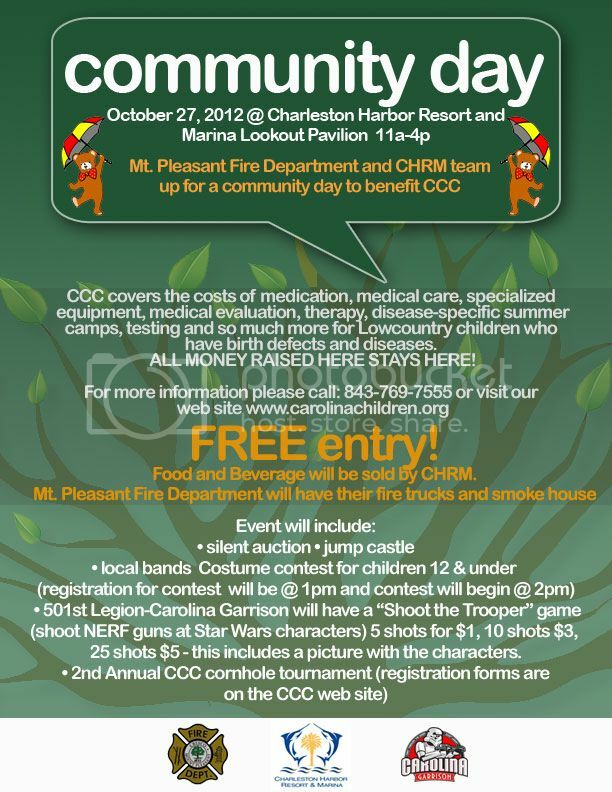 The Carolina Children's Charity of Charleston has invited the Carolina Garrison to the Carolina Children's Charity - Community Education Day. At this event they are asking if we would be interested in helping to raise money for the charity. I mentioned a possible "Shoot the Trooper" game to help raise $. Currently I am working out the details and working on a simple "arena" for participants to donate $ to fire NERF guns at us. This is going to be a really fun event, a great cause and is being held at an awesome location. 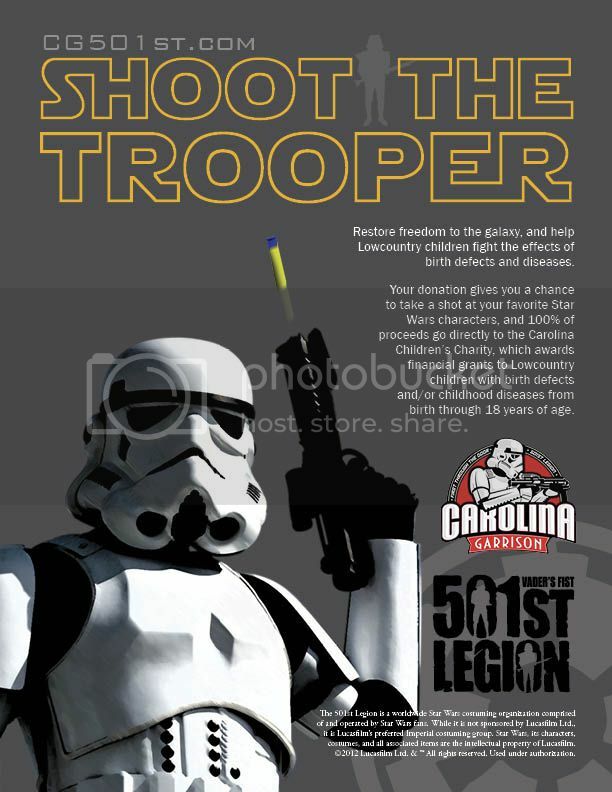 Anybody willing to be shot at by NERF guns (while in costume) to help alongside the Carolina Garrison to raise $ for the charity is more than welcomed to play. Unfortunately, the CCC Community Day has been CANCELLED for Saturday (Oct. 27) due to incliment weather. Please stay tuned for the rescheduled date. Hopefully those that said they could've trooped this weekend can still do it once I get a rescheduled date. Hope this isn't last minute for anybody planning on coming. Thanks so much for the invitation, and so sorry to hear of the cancellation. Yes, please do keep us informed of any future events! Feel free to post here, and we can reference them in our event planning area. I assume you've also posted at the Georgia Garrison?